A project in Indonesia's Tesso Nilo forest is helping to conserve the trees favoured by wild bees - helping both local people and the forest to survive. Jakarta, Indonesia - A project in Indonesia's Tesso Nilo forest, located on the island of Sumatra, is helping to conserve the trees favoured by wild bees — helping both local people and the forest to survive. The Logas Tanah Darat Community ethnic group lives in seven villages on the outskirts of Tesso Nilo forest — one of Sumatra's last-remaining lowland forests. The people live in a traditional way. In addition to cultivating seasonal crops like rice, they also harvest non-wood forest crops like wild honey. Seventy people are directly involved in and depend on the honey business for their livelihood, but ultimately the livelihood of more than 300 people gain from this village industry. The trees favoured by wild bees as sites for their beehives are called sialang, and are usually higher and stronger than other trees in the forest. Traditional community law protects sialang trees and their beehives, as well as about 100 hectares of forest surrounding each tree. The seven villages have 154 trees, meaning they provide protection for 15,400 hectares of forest. 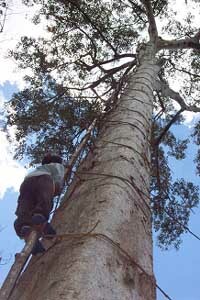 However, sialang trees favoured are also favoured by loggers as they fetch a better price. Many of sialang species are now critically endangered. The logging not only threatens the forest, but also the livelihoods of the local traditional people who collect wild honey. To counter this, WWF-Indonesia has engaged with the Logas Tanah Darat Community to raise awareness of the threats to the forest, as well as its long-term value. 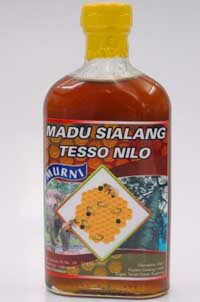 WWF is promoting the wild honey business in order to minimize illegal logging in Tesso Nilo. The benefits would be great, not only for the forest but also for the people who collect the honey and market it. The community's 154 trees have 2,044 bee hives, which produce 81,760kg of honey per year. The honey currently sells for 7,000 Rupiah (US$0.83) per kg, but if management were improved, production could triple and the sales price could be doubled. Thus up to 1.2 billion Rupiah (US$142,000) per year could be generated from honey collected by these seven villages. WWF is helping the villages protect their trees and the forest around them, develop producer groups, improve production techniques, and market their product to a wider audience. Training programmes and new equipment have been provided to ensure that the wild honey business is well run and produces a high-quality product. WWF has also helped find sponsorships for continuous marketing and production of wild honey from the forest. In addition, the Indonesian government has issued a permit on preserving Hutan Sialung, a forest of sialang trees inside Tesso Nilo. Located in Riau province, Tesso Nilo contains the highest level of lowland forest plant biodiversity known to science, and is one of the last viable habitats for the Sumatran elephant. Tesso Nilo and surrounding areas of natural habitat are threatened by clear-felling and illegal logging, due to the enormous amount of wood and plantation land required to supply Riau's pulp, paper, and timber mills. At the current rate of deforestation, Sumatra as a whole is forecast to lose the last of the remaining tracts of lowland forest by 2005. Illegal logging for paper industry and forest clearing for oil palm plantation is threatening to destroy Indonesia's Tesso Nilo forest completely. Harvesting wild honey from a sialang tree. Wild honey harvested by the Logas Tanah Darat Community.